The German sensor company Sick has developed a technology that can cascade up to 32 safety sensors and switches from different manufacturers on a loop almost 1km long, while meeting the PLe performance level. The Flexi Loop system is said to offers new levels of scalability, diagnostics and I/O connection capacity in a compact space and at a competitive cost. “This is what the industry’s been waiting for,” says Sick's UK safety specialist, Dr Martin Kidman. “It has been fairly common practice to connect interlocks and other safety contacts in series but today’s engineers are faced with increasing demands to meet PLe levels of safety using the convenience of series connection. “However, changes to key safety standards mean that traditional hard-wired series connection of switches using volt-free electro-mechanical contacts is no longer advisable in higher risk applications,” he continues. “Having to accommodate all the equipment, cabling and connections required to comply can add to the cost and cause space problems. “Each Flexi Loop module assures PLe as long as the sensor can fulfil that performance level, and makes calculating complex SIL or PL parameters for your safety system a doddle,” Kidman adds. The new system allows series connection of dual-channel devices, while allowing high diagnostic coverage and eliminating the potential for “fault masking”. It can accommodate standard safety sensors and switches from any vendor. It also allows designers to connect any safety system in series with another without compromising the PLe integrity. The IP67-protected system can cascade up to 32 safety sensors or switches on one loop and create up to eight separate loops, thus supporting up to 256 sensors on eight dual-channel inputs. It reduces the clutter of traditional connections and uses standard cables with five-pin M12 connectors. No special connections or shielded cables are needed. Each loop for one safety shut-off channel can be up to 960m long and the modules can be separated by up to 30m. As well as being suitable for new installations, the system can also be used to upgrade existing automation, robotic and manufacturing processes. 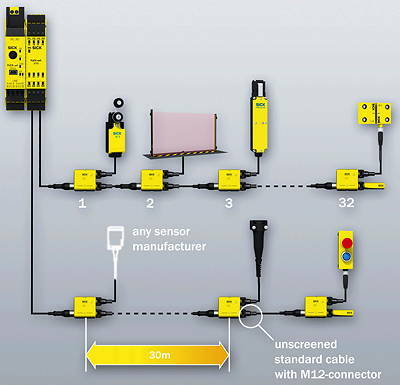 Diagnostics and status monitoring are provided for each connected sensor, avoiding the need for a field bus or complex network addressing. As well as indicating which device has switched and why, LED indicators on each node give live status information, without having to refer back to a desk-based control point. This diagnostic capability is based on Sick’s Flexi Soft controller platform which allows status monitoring at the controller or via an HMI/PLC interface. Each Flexi Loop module indicates loop status, plus each of the safe and standard I/O. One module can indicate the status of up to 31 modules, while another can be used to inject extra power for devices such as laser scanners, solenoid interlocks and light curtains. Using Flexi Loop with the existing Flexi Soft system allows remote diagnostics information to be passed to higher-level control systems via gateways. Supported networks include Profinet, Profibus, CANopen, EtherCat, Sercos, Ethernet/IP, DeviceNet and CC-Link. Free software provides pre-approved safety function blocks, simulation functions and safety declaration documents at a press of the button.